I have always loved to travel but had never really aspired to achieve status with any one airline, rather preferring to grab the cheapest flight available. That all changed in the last year from having a number of paid trips planned mostly with Qantas and reading Point Hacks in Australia. Along with the chance to purchase a reduced price Qantas club membership in the middle of 2015 I have been intent on achieving Silver status this membership year. In the second half of last year my partner and I decided to spend Christmas & New Years with her family in Perth. We planned on returning via Melbourne for 3 nights from 3rd January to catch up with friends and thanks to a great Business Class sale fare, scored Emirates’ A380 back to New Zealand. I booked all legs of our trip for reasonable ticket prices, except the Melbourne-Auckland sector which was proving an expensive proposition in the New Year. I decided to set up a couple of flight alerts and see what came along. To my surprise I received notification of a huge drop in Qantas business class fares on the date I wanted. NZ$435 one way Melbourne-Auckland, 50% off and an amazing price given that economy was still going for around NZ$370 at the time. While I’m far from a flying snob I also noticed that for an extra NZ$60 we could have the opportunity to book a QF ticket in Emirates A380 business class, a premium step up on Qantas’ trans-Tasman 737 business offering and a great Christmas treat. 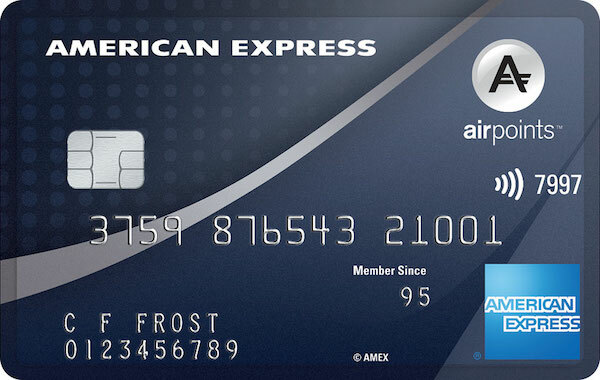 In the process we would pocket 80 status credits each toward our silver target – a no brainer, so I booked them quick before someone turned around and said it was a mistake. If booking with points, this flight would normally require 36,000 Qantas Points + taxes. 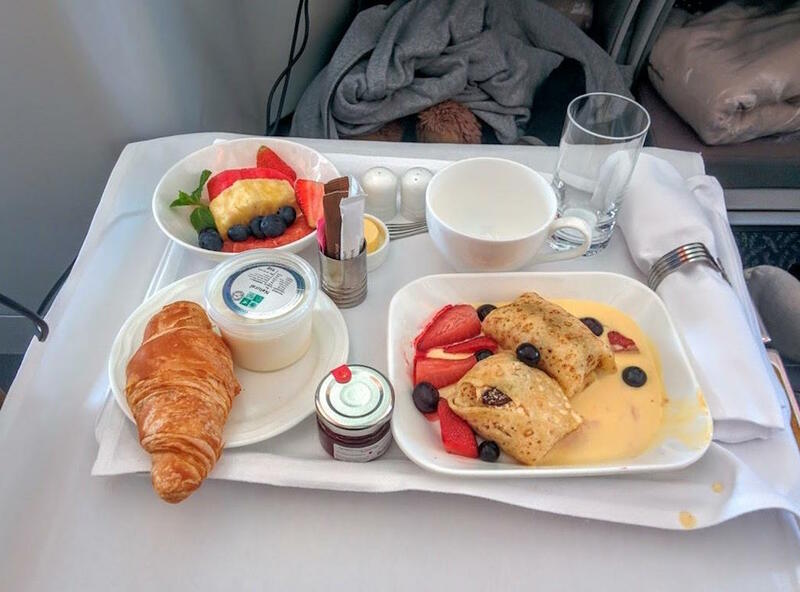 This would seem a reasonable cost for Emirates lounge access, a few hours of fine service, good food and lie flat A380 travel on your way across the Tasman, less so for Qantas’ own angle-flat 737 business service. 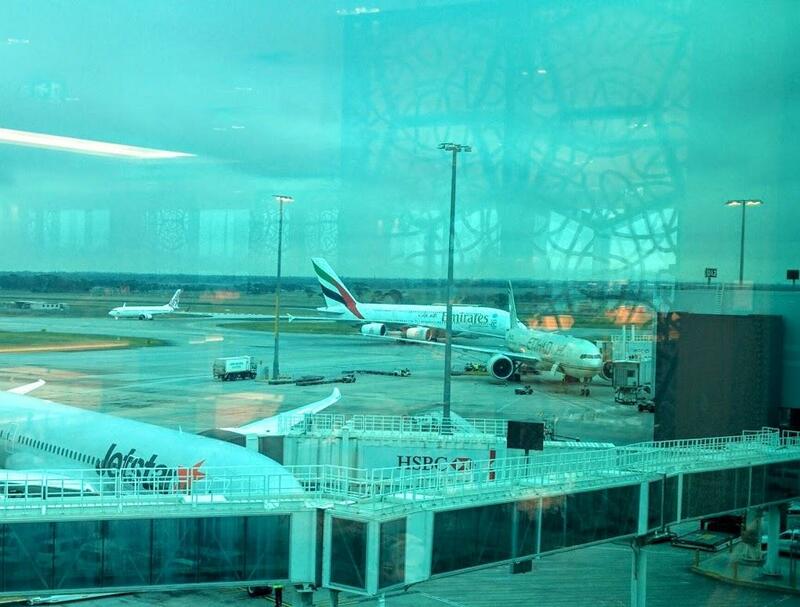 We were staying at an apartment in the city but also had a rental car so despite the early 8:10 am departure we were able to get to the airport with plenty of time to check out the newly opened Emirates business lounge at Melbourne airport. Although we were booked on a QF coded ticket, check in is still through the Emirates counter. We arrived to find the business queue empty so were checked in quickly by the smartly dressed Emirates staff behind the counter. She handed us our boarding passes and express immigration pass along with directions to the newly opened lounge. 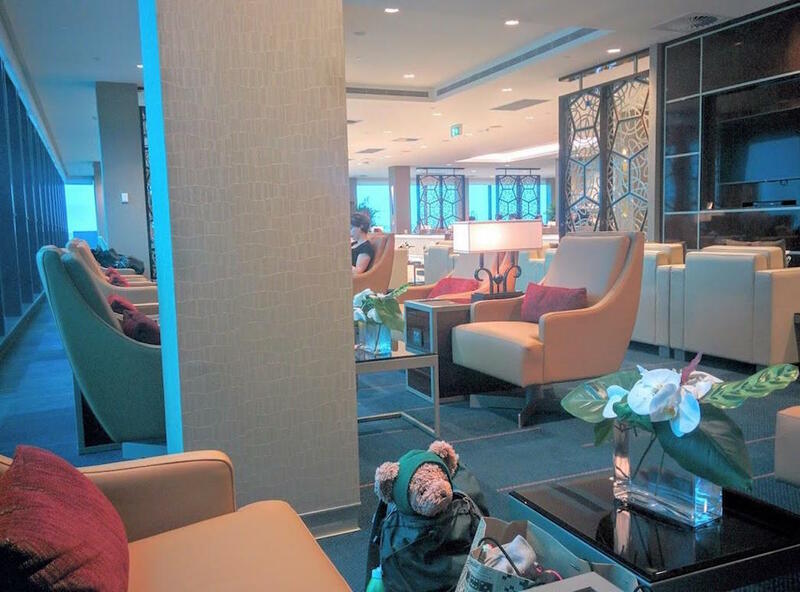 Behind double glass doors beside Gate 10, an escalator takes you up to a large entrance foyer and a stylish reception counter where you are welcomed in by more smiling Emirates staff members. 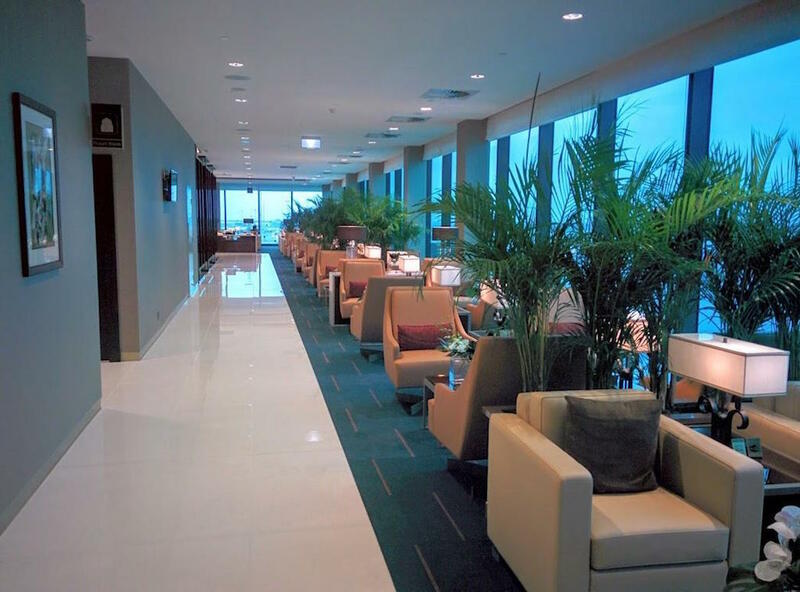 The décor is the familiar browns, beiges and gold standard with Emirates planes. 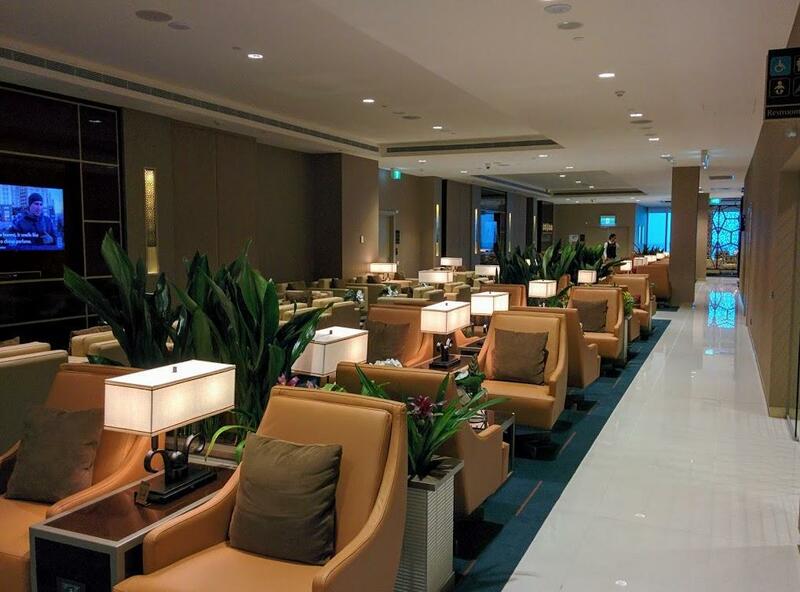 The entire lounge area itself is square with the kitchen, showers, offices and staff facilities in the middle. This means you can walk around the entire lounge in a circle and end up back at the reception. It’s odd but makes for lots of semi-private space to bunk down for breakfast. On turning either left or right from reception you’ll find a selection of magazines and newspapers. 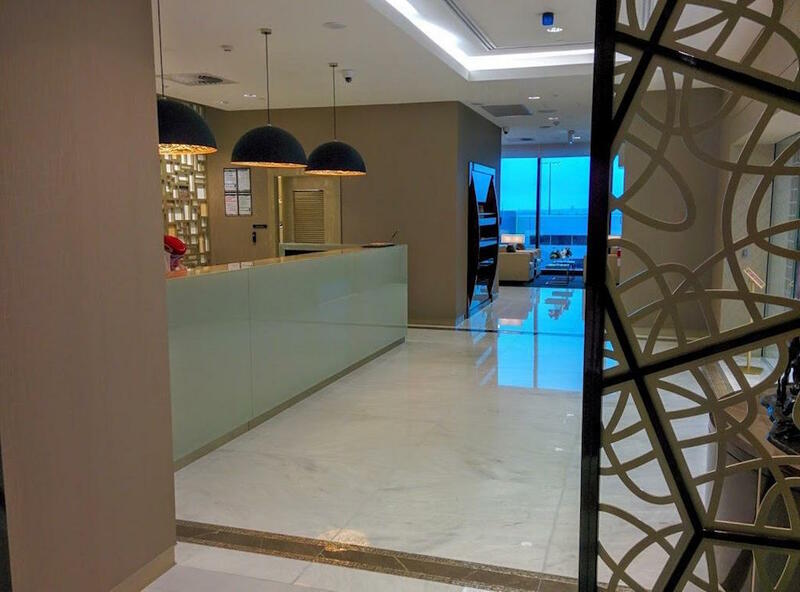 Just after 6:00am in the morning and the lounge is pretty empty, we are greeted by another friendly staff member along with a well stocked drinks bar through the left side of the lounge. 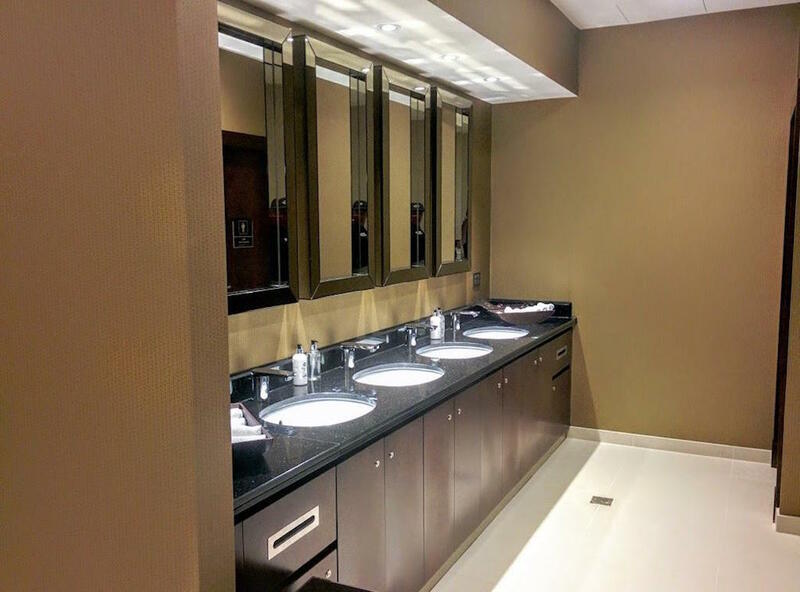 The toilets and showers are also accessed from this side through another set of automatic glass doors. We find a nice quiet corner of the lounge where we enjoy the free WiFi while being away from the new arrivals strolling in. Time for a coffee and unfortunately no barista, only an automated machine albeit a Vittoria one, still pretty gutted given the quality of the rest of the set up. 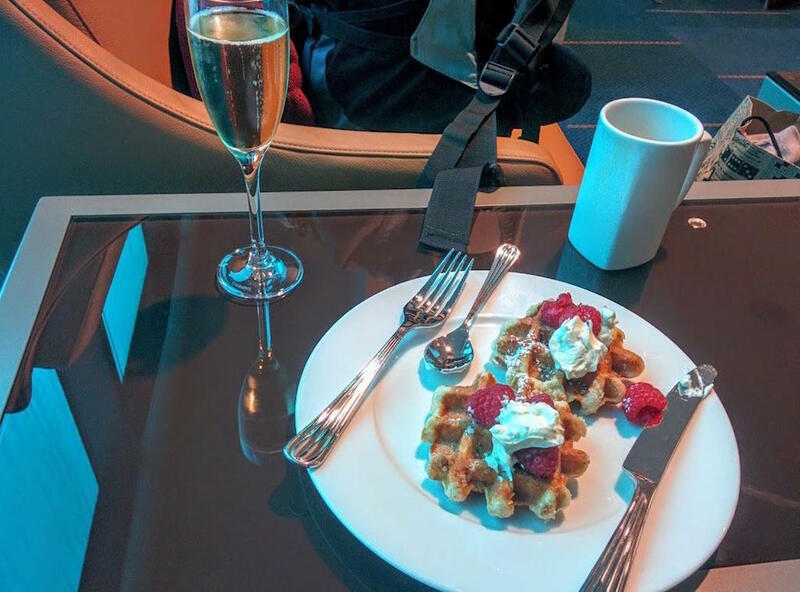 Breakfast time and Waffles and Raspberries along with a couple of glasses of Moet – “why not, I’m still on holiday”. 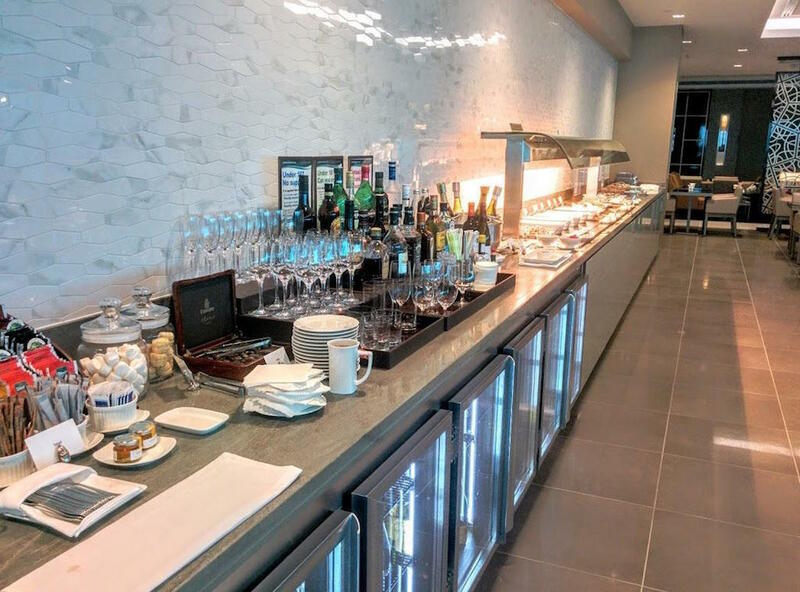 The breakfast area is located in the centre of the lounge and has another well stocked bar with 2 Champagne options, good New Zealand and Australian wines and most premium beers and spirits. Breakfast is self-serve with a buffet-type servery and a separate seafood/salad bar area. The food itself is nice for breakfast but nothing special. Still – our plane has been delayed and I’m happy to be helping myself while we are waiting. We are able to watch our plane arrive 45 minutes late from the comfort of the lounge, so still time for another coffee and quick a look around. 40 minutes later we are called to make our way to gate 11 for boarding. Emirates have the largest fleet of A380’s of any airline in the world and this is one of 3 that currently ply their trade across the Tasman every day to Auckland and return. The others from Sydney and Brisbane, all as an extra leg in their daily return circuit from Dubai to Australia’s East coast. 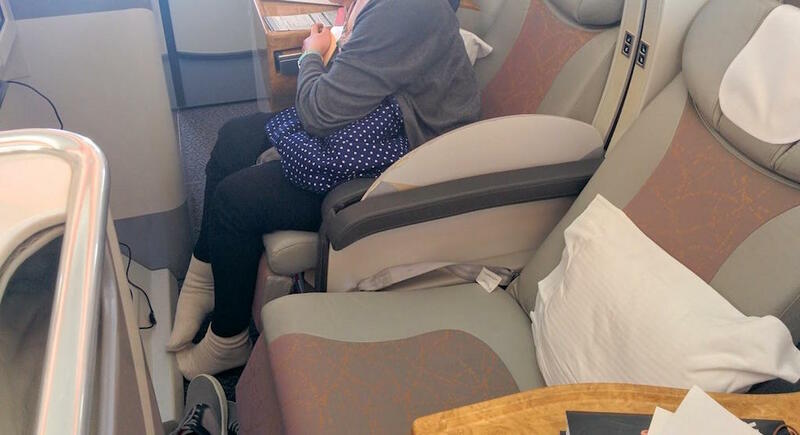 My first experience flying the superjumbo had been Sydney-Auckland in economy during returning from a trip to South East Asia in 2015. That flight had been the best economy flight I had experienced so had been looking forward to checking out the upper deck set up. The A380 business class has a 1-2-1 layout through the entire upper level, however the seating is staggered down both sides of the plane. Because of this I had booked middle seats 14E & 14F where my partner and I could enjoy the experience side by side. The armrest between the two seats has a panel that can be raised or lowered to depending on if you know the person next to you, or you’re just not talking to them at the time. 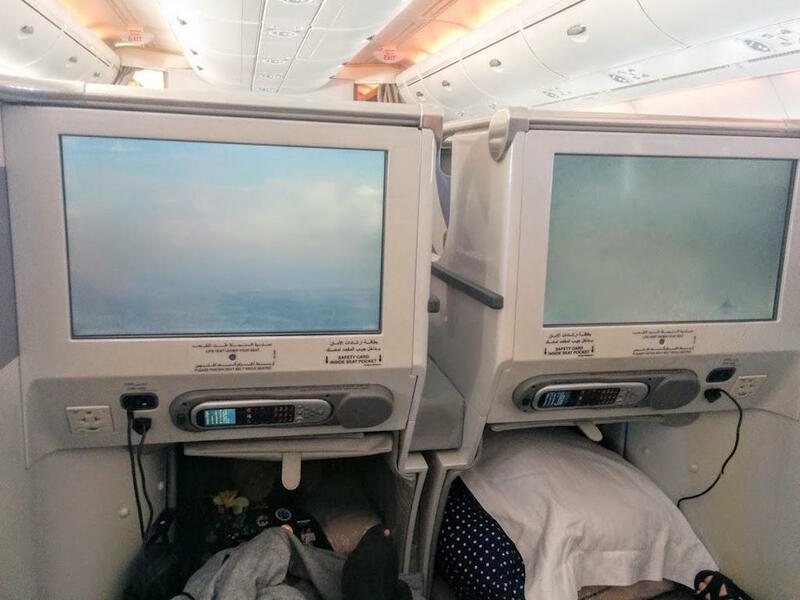 Luckily this wasn’t a problem I had to deal with, although if I was flying alone I definitely would have booked a window seat which is far more private. We were welcomed onboard and directed to our seats, both taking different paths as our seats were accessed from separate aisles. 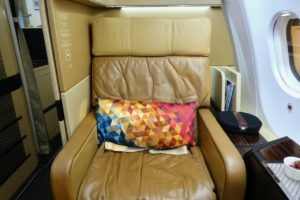 As is expected the usual Emirates brown/beige/gold/timber theme completes the interior cabin décor albeit getting a little on the ageing side. One strange thing about this layout is that the person next to you is served by a different attendant than yourself. This was most evident when my partner ended up with a glass of champagne before takeoff while I got left waiting until the seatbelt signs had turned off. Not disastrous just a bit odd and disappointing that we missed a chance to toast our special flight. The seats are fully lie flat with a built in massage function and although I hadn’t acquired much sleep the night before, I didn’t completely test this out during the flight. There were however a number of passengers who had obviously had even less than me and chose to sleep through the entire flight. On the aisle side of each seat there is a large sized unit with good sized counter top for keeping your books, devices or other valuables close at hand. The unit also holds a small bar with bottled water and a couple of sodas to make use during flight. Each seat is fitted with a large inflight entertainment system with both touch screen monitor and touch screen handheld controller. The selection of entertainment available was vast and you can also access the view from 3 cameras mounted on the nose, fuselage and tail of the aircraft, interesting perspective of takeoff and landing. My opinions were mixed about the system, while size and content were excellent the touch screen had a delay and I found the control device a bit pointless – maybe on a long flight when you’re lying down it might be useful. Another small issue is that you can only plug the headphones into the screen in front which gets in the way when dining, whereas a socket in the unit beside you would be much more convenient. Upon finally receiving my long awaited glass of champagne I was invited to order breakfast. After having well and truly satisfied my hunger during our extended stay in the lounge, breakfast wasn’t really on my agenda. However looking through the menu I did notice the option of Ricotta crepes which I decided I needed to at least give a try. The crepes were superb and were accompanied by fresh fruit with yogurt and a croissant with strawberry jam. More than I could manage to get through, and very impressive. Fresh coffee was to follow which helped finish off the morning in the right way. Having well and truly overdone myself on the eating I was anxious to finish watching the movie I was half-way through when breakfast arrived. However I decided to take a quick look around while everyone was occupied and before the end of the flight where I’d lose the opportunity. The upper level was almost full up and there were passengers milling around everywhere. I only saw 2 spare seats and wondered how many had netted the same deal I got. At the rear area of the upper deck there is a small bar that unfortunately was not in service at the time, I’m sure this would be a well frequented venue during long haul and evening flights. While there, I decided I should check out and make use of the toilets. They were compact much like any airplane toilet just nicer, however I was surprised to find a window in the one that I had chosen. It’s an interesting perspective sitting on a throne with a view. Having made my way around exploring the cabin and enjoying the view from my throne I returned to my seat to watch the last 30 minutes of the movie Everest which had taken me all flight to get through. Despite leaving 45 minutes late we had managed to make up 20 minutes in the air, and I was glad to be home after almost 2 weeks away with such a pleasant flight experience. I enjoyed the whole experience greatly and probably would have rated it higher had it not been for the drinks issue prior to take-off. A small point maybe, but I believe it’s the service which is the most important when measuring these sort of experiences, particularly if the length and/or time of your flight doesn’t allow you to fully experience other features. Overall the service was good throughout check in, lounge and flight but sometimes it’s the little things (or lack of) that stand out. The enclosed staggered seating was a lot different to the reverse herringbone layout I have experienced on Air NZ. I felt a bit penned in at times but during a long haul flight I’m sure it would be wonderfully peaceful. Overall the cabin seemed a little dated but that did not detract from the quality of the facilities. The entertainment system albeit ageing is more than opulent for a skip across the Tasman and I would love to truly test out all the features on offer during a long flight to Dubai, another one for the future. 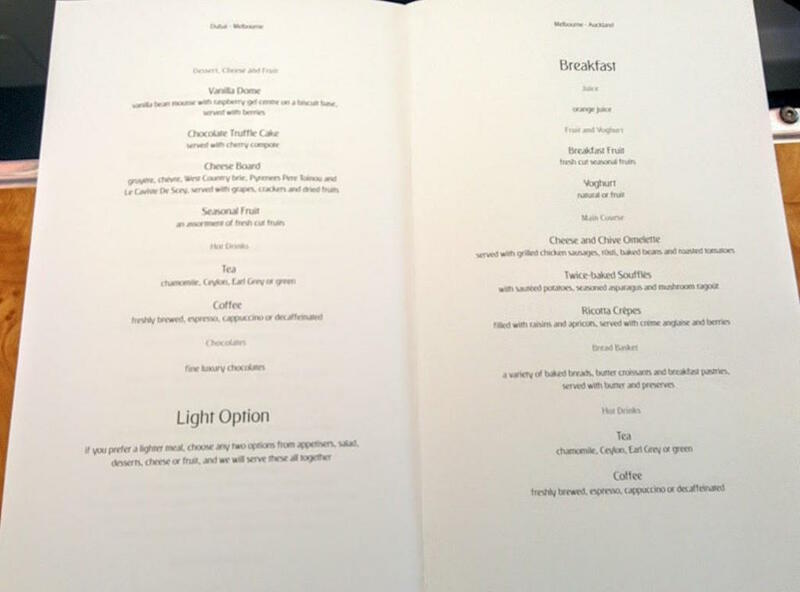 The food could not be faulted throughout the lounge or flight. 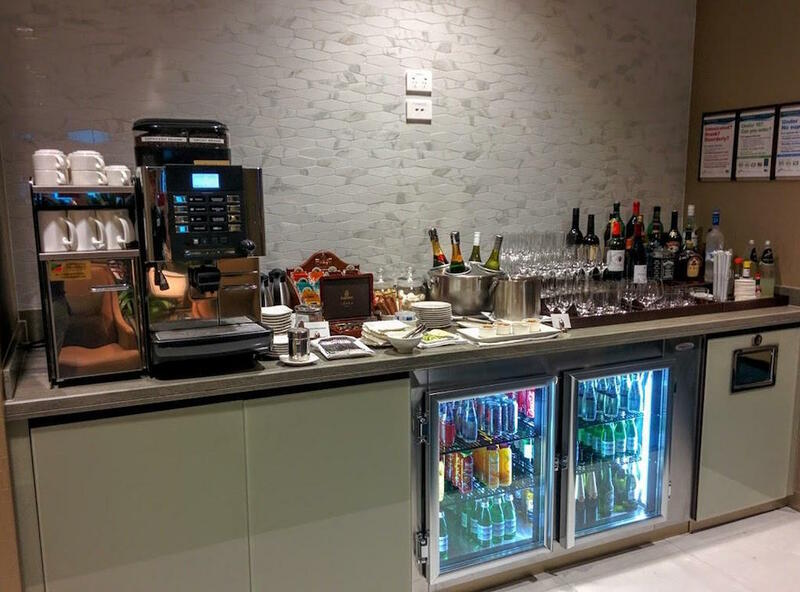 The lack of barista coffee in a new international business lounge did surprise me though, particularly since you can even find one in a number of Qantas domestic lounges now. 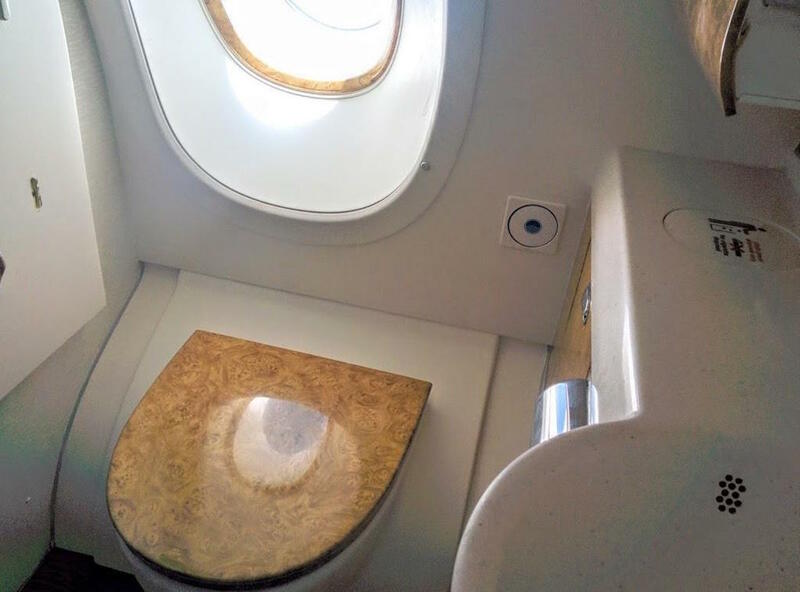 The bar at the rear of business would be a useful venue during long haul and the view from the toilet is pretty amusing! As a final note while my rating of 4 out of 5 may seem a little harsh, it must be taken in consideration with the fact that the flight was short and first thing in the morning. I’m sure a longer journey where you could truly experience all the benefits Emirates A380 business had to offer would provide an equally higher mark. And besides if we never thought that something could be done a little better, it never would.